An enormously riveting and inspirational tale of WWII and the Holocaust, Partisans of Vilna chronicles the amazing endeavors of the Jewish resistance fighters. Highly acclaimed during its theatrical run, the film has been described as “a stirring, extremely honest and heart rending celebration” (New York Magazine). Co-written by director Josh Waletzky (Image Before My Eyes) and producer Aviva Kempner (The Life and Times of Hank Greenberg), Partisans of Vilna skillfully blends songs, newsreels and rare archival footage dating from 1939-44 and contemporary interviews with forty partisan survivors (including Abba Kovner, a founder of the partisan movement and one of Israel's leading poets). The film explores the difficulties of organizing under the anarchic conditions of the ghetto in Vilna, the capital of Lithuania. 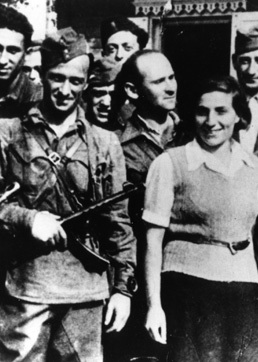 Recounting how a commando unit was formed under tremendous risk to conduct sabotage missions against the Nazis, the film explores the moral dilemmas facing the Jewish youth who organized an underground resistance in the Vilna ghetto, and fought as partisans in the woods against the Third Reich. More than just a record of great historical importance, Partisans of Vilna is an intensely stirring and uplifting commemoration of heroes during the darkest of times. Enlightening, truthful, challenging, heartbreaking... one of the best and most eloquent documentaries on the suffering and dilemmas Jews faced." "You'll know you are watching heroes. Their courage is visible and unmistakable"
"Rich, poignant, terrifying and ennobling,"
"A movie that must be seen: Stirring, absorbing, incredible." Filmmaker available for special appearances.